The Missouri Lottery has provided support to the Humane Society of Missouri and St. Louis County Animal Control in a campaign for holiday pet adoptions from Nov.16 to Dec. 31. 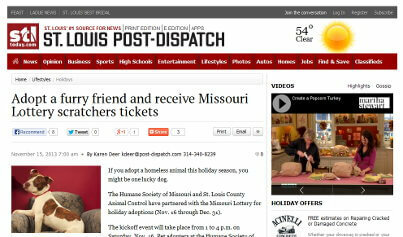 Under the program, any person who adopts a pet during the promotion period will automatically receive 10 Missouri Lottery $2 “Santa Paws” holiday Scratchers. The campaign launch on Nov. 16 will feature lots of activities where guests may win lottery tickets or a Missouri Lottery gift. This is an event where dogs and their new owners are expected to go on a scratching spree!